Romantic & enchanting! 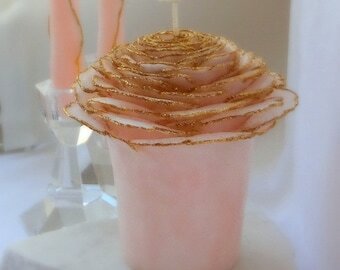 Glitter Rose Wedding Candles, simply exquisite for the wedding ceremony, reception decor, gift for the newlyweds. Choose the pillar by itself and use your own tapers, or add a set of 2 matching Glitter Rose Tapers (for additional cost) from the drop-down menu. 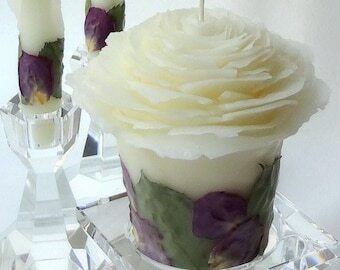 Each candle is a work of art, handmade to order in my "Garden" style (resembling an open rose with flared edges). No two candles look exactly the same. 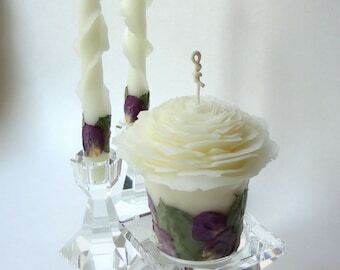 These unique rose candles are made of pure beeswax - in pale colors that I hand-dye to complement your wedding palette. 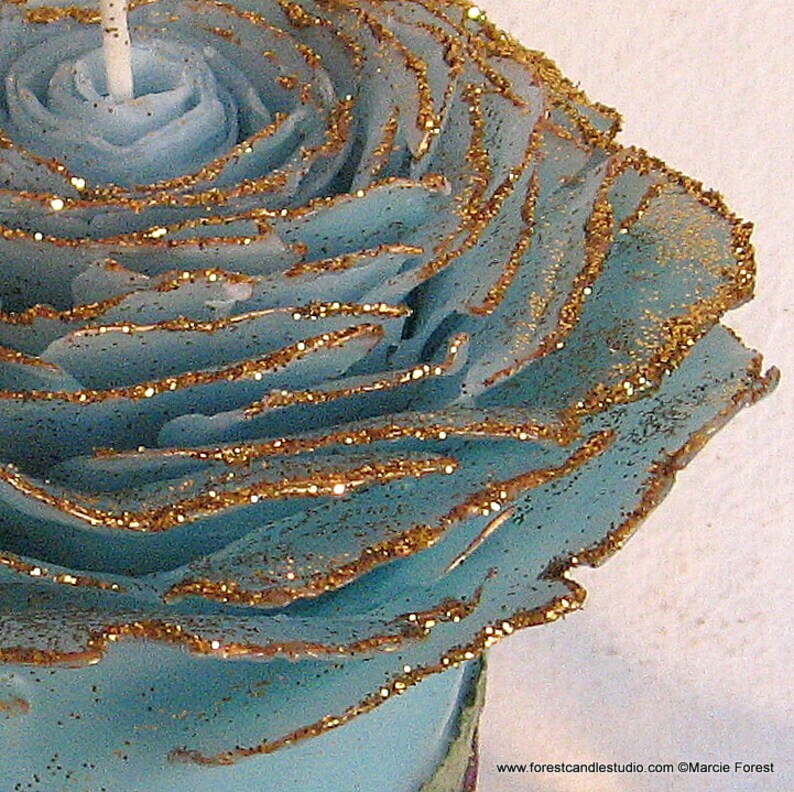 Adorned in your choice of silver or gold wax paint & glitter as shown in the photos. 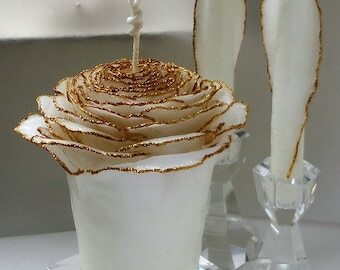 Ribbons, jewel accents, rose petals & leaves are available for an additional charge. 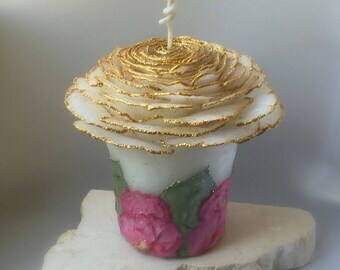 If you'd prefer a different candle color, size, or adornment, contact me to inquire about availability & pricing. A variety of options are available and custom orders are welcomed. "The candle set is gorgeous, exactly what we had wanted for our wedding, and Marcie shipped it in plenty of time despite my late order! Could not ask for a better experience or result." "I cannot brag about this item and seller enough!! The shop owner is SUPER sweet and personal! She went above and beyond to make sure my purchase was absolutely PERFECT!! We can't wait to use our unity candles during our wedding ceremony! They are GORGEOUS!! 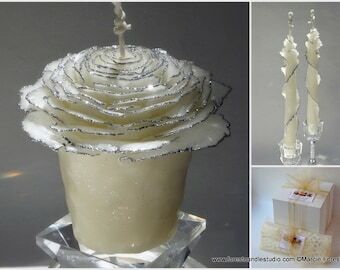 :)"
Photos show a variety of unity candles from previous orders. Yours will be made to order especially for you in the colors of your choice. Contact me for pricing if you'd like additional adornments (some examples in last photos - rose petals & leaves, ribbon, jewel accents, etc). 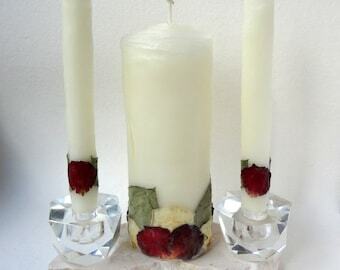 (Light the Rose Pillar 2-3 hours at a time, leaving the outer shell intact. Please tell me the wedding date & date needed by in the "note to seller" section during checkout. The current estimated production time for this item is approx 3-4 weeks. Need the candles sooner than what's listed? Contact me prior to purchase to confirm. Rush orders accommodated when possible (there may be an additional charge). In my signature packaging: The rose pillar in a gift box, the tapers in natural kozo hemp lace paper, tied with tulle ribbon. A Forest Candle Studio mini note card is enclosed (candle info & burning instructions are on the back). See PAYMENT OPTIONS, ESTIMATED DELIVERY DATE & SHIPPING INFO for this item (and my general SHOP POLICIES) on the right hand side &/or below this listing, depending on your viewing device. If you have any questions get in touch! My "standard" method of shipping: USPS Priority Mail w/ tracking & insurance, approx 3 days delivery time but can take up to 5 days. Guaranteed overnight delivery (2 days to some locations) via USPS Priority Mail Express is an available option during checkout for an additional charge. Please bookmark this page or add my shop to your Etsy Favorites so you can find me again easily!